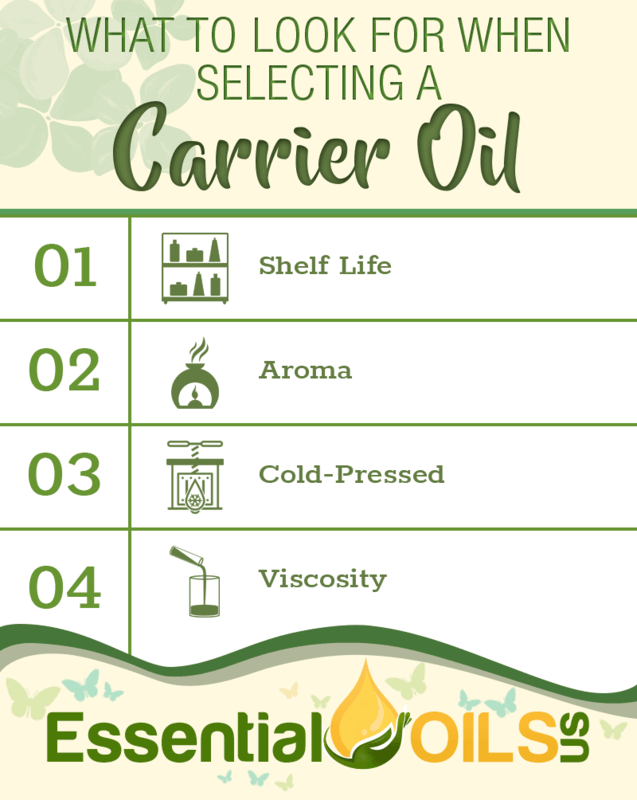 If you’re interested in using essential oils for their therapeutic properties, you’re going to need to know a thing or two about carrier oils. Derived from the fatty parts of plants, carrier oils are oils with which you can dilute essential oils. Because essential oils can cause irritation when applied directly to the skin, it’s always recommended that you dilute your oil with a carrier oil. These carrier oils will decrease the chance of skin irritation without interfering with the essential oil’s therapeutic benefits. Of course, there is a wide variety of carrier oils that you can use. They all offer unique benefits and vary tremendously in price. 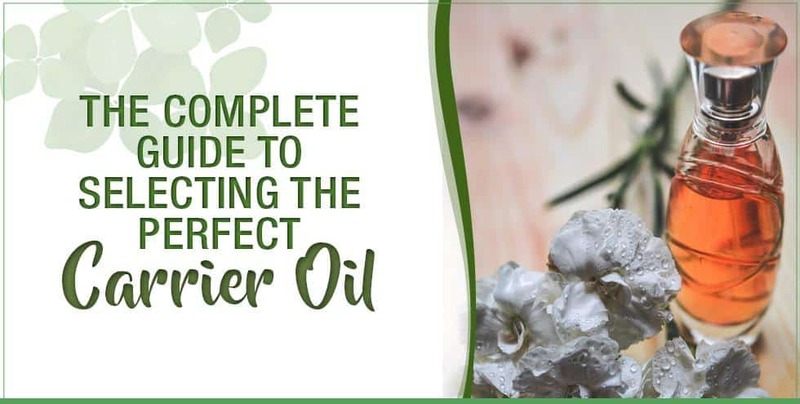 Today, you’re going to learn everything that you need to know about carrier oils so that you can select the right one for your particular needs. Because essential oils are volatile, they start to evaporate within seconds of being applied to the skin. This means that they can severely irritate the skin when applied undiluted. A carrier oil is not volatile, allowing it to prevent irritation by acting as a barrier between the essential oil and the skin. Although carrier oils are derived from plants just like essential oils, their aromas are not nearly as potent, meaning that they won’t take away from the aroma of the essential oil that you’re using. And, they won’t interfere with the healing properties that are found within the chemical compounds of the essential oils. There are other benefits to using carrier oils as well. By diluting a small amount of an essential oil with a carrier oil, you’ll be able to get more coverage out of just those few drops. Plus, the viscosity of most carrier oils helps the essential oils’ chemical compounds absorb into the skin more quickly and easily. Because carrier oils contain fatty acids, they can go rancid over time, especially if exposed to excessive light or air. Each carrier oil has a different level of fatty acids, meaning that each oil has a different shelf life. When buying a carrier oil, check the bottle to see if it has an expiration date. This will give you a good idea of how much use you will be able to get out of it. Of course, there are cheap carrier oil products that contain synthetic preservatives in order to prevent them from going rancid prematurely. The problem is that these synthetic preservatives are not very good for the skin or the body. So, when you’re looking at a bottle of carrier oil, check its list of ingredients first. If the oil contains any strange-sounding ingredients, look them up before buying the bottle. It should be noted that many carrier oils contain vitamin E, a totally safe and natural preservative. Carrier oils are not volatile. Therefore, their aromas are not nearly as strong as those of essential oils. Still, you’ll notice subtle scents when you smell different carrier oils. If your nose is particularly sensitive, you’ll find that some oils smell sweet while others smell nutty. If you’re sensitive to these aromas, make sure that you select a carrier oil that has an aroma that you like. True carrier oils are cold-pressed. This means that the oils are extracted from the plants without the use of heat. When heat is used to extract oils, the oils lose many of their therapeutic benefits. Therefore, always select a cold-pressed carrier oil. Every carrier oil has a different viscosity. Some oils are extremely thin while others are as thick as molasses. Ultimately, viscosity is a matter of preference. A thinner oil like olive oil glides along the skin with ease while a thick oil like castor oil is very sticky. Not all oils are carrier oils. For instance, mineral oil is derived from petroleum, a synthetic substance that is known to cause skin irritation. Also, you should never use butter or margarine as a carrier oil as the fats found in these products prevent total skin absorption. 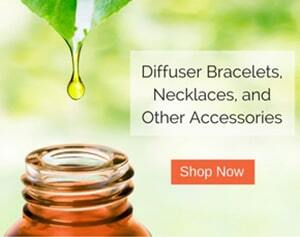 Typically, you should dilute one drop of an essential oil with one teaspoon of a carrier oil. This will prevent your skin from becoming irritated once you apply the essential oil. For children, pregnant women and those with extremely sensitive skin, it is recommended that you double the amount of carrier oil per drop of essential oil. 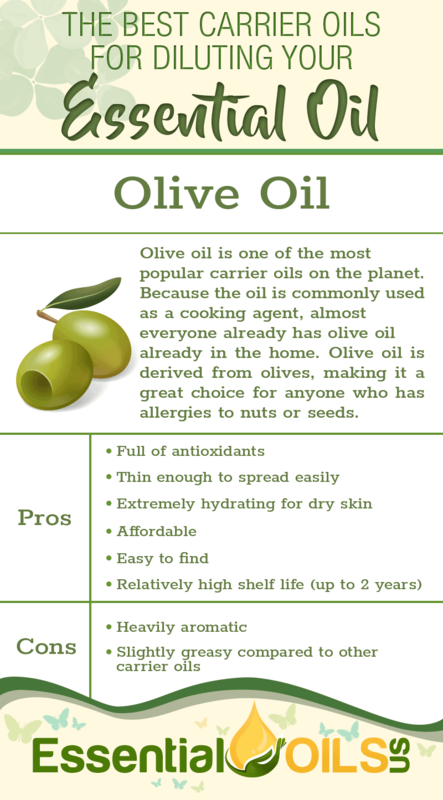 Olive oil is one of the most popular carrier oils on the planet. Because the oil is commonly used as a cooking agent, almost everyone already has olive oil already in the home. Olive oil is derived from olives, making it a great choice for anyone who has allergies to nuts or seeds. Many people love olive oil because of its ability to deeply nourish the skin’s layers. Plus, the oil has a high level of antioxidants, giving it the ability to fight the signs of aging while preventing cell damage caused by free radicals. It’s also a very heavy oil, meaning that a little goes a long way. It must be stated that the best olive oil for this type of application is cold-pressed extra virgin olive oil. Any olive oil that has been subjected to heat will have lost many of its therapeutic benefits. Coconut oil is an excellent carrier oil because of its nourishing properties and its ability to seriously hydrate the skin. The oil is white and solid when you purchase it in a jar. However, it melts quickly when it makes contact with warm skin. Coconut oil has a fairly potent coconut aroma which, depending on your personal preferences, may or may not be a good thing. However, it cannot be denied that coconut oil’s moisturizing abilities are incredible, making it an excellent choice overall. Jojoba oil is another extremely popular carrier oil. The oil is uniquely similar to sebum, the oil that our skin naturally produces in order to keep itself hydrated. Therefore, it’s an excellent choice for skin that is prone to acne. Plus, jojoba oil has anti-inflammatory properties, giving it the ability to heal a wide range of skin conditions. 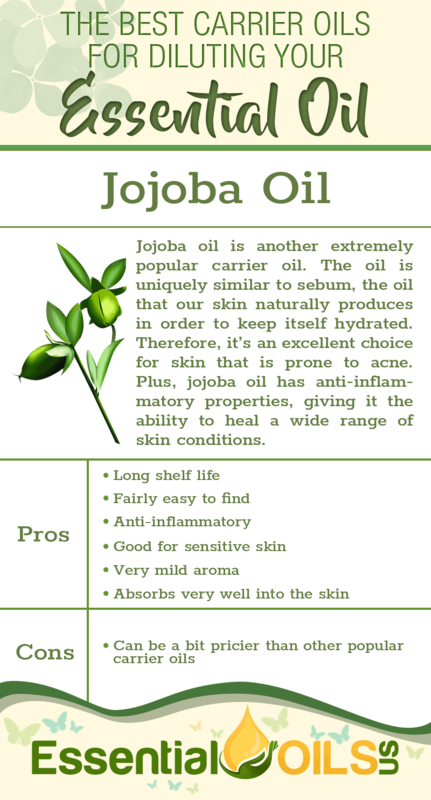 Jojoba oil is extremely hydrating. And, its aroma is barely noticeable, meaning that it won’t overpower the aromas of other essential oils. 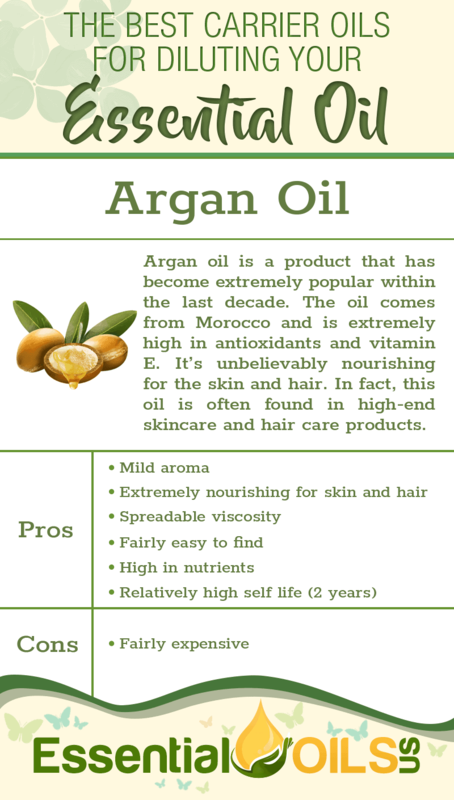 Argan oil is a product that has become extremely popular within the last decade. The oil comes from Morocco and is extremely high in antioxidants and vitamin E. It’s unbelievably nourishing for the skin and hair. In fact, this oil is often found in high-end skincare and hair care products. Argan oil has a nutty aroma that is very mild. However, if you have a sensitive nose, you’ll pick up on its scent immediately. Because of the product’s recent popularity, you’ll find many brands that sell diluted argan oil. Therefore, it’s important to find a brand that delivers pure argan oil. 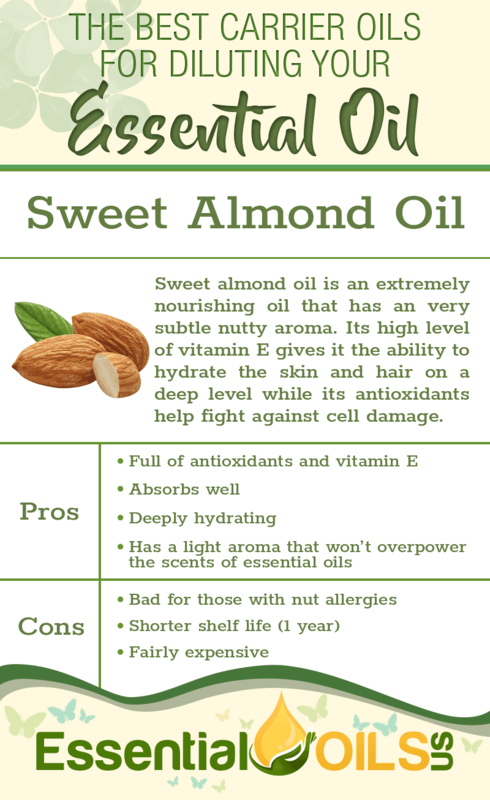 Sweet almond oil is an extremely nourishing oil that has an very subtle nutty aroma. Its high level of vitamin E gives it the ability to hydrate the skin and hair on a deep level while its antioxidants help fight against cell damage. The oil’s viscosity is on the thin side, making it an excellent choice if you want to create a massage oil. However, it does tend to leave some oily residue behind. 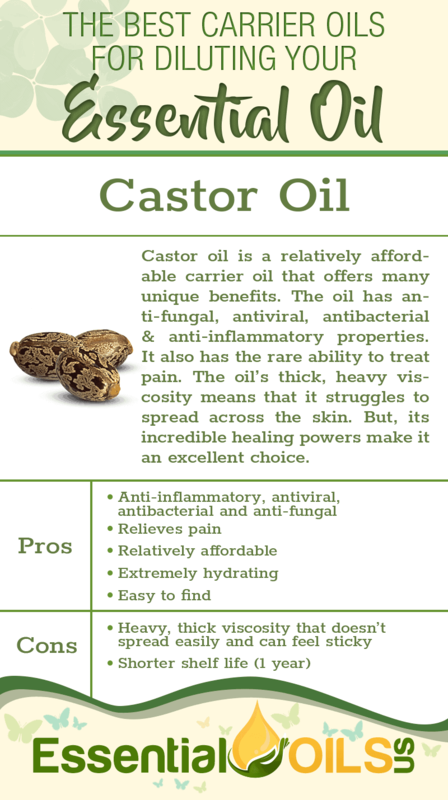 Castor oil is a relatively affordable carrier oil that offers many unique benefits. The oil has anti-fungal, antiviral, antibacterial and anti-inflammatory properties. It also has the rare ability to treat pain. The oil’s thick, heavy viscosity means that it struggles to spread across the skin. But, its incredible healing powers make it an excellent choice. Grapeseed oil is a popular carrier oil because of its ability to absorb completely into the skin, preventing that oily feeling that tends to linger long after you’ve applied your essential oils. The oil is derived from the seeds of grapes, giving it its high level of antioxidants that fight against cell damage. 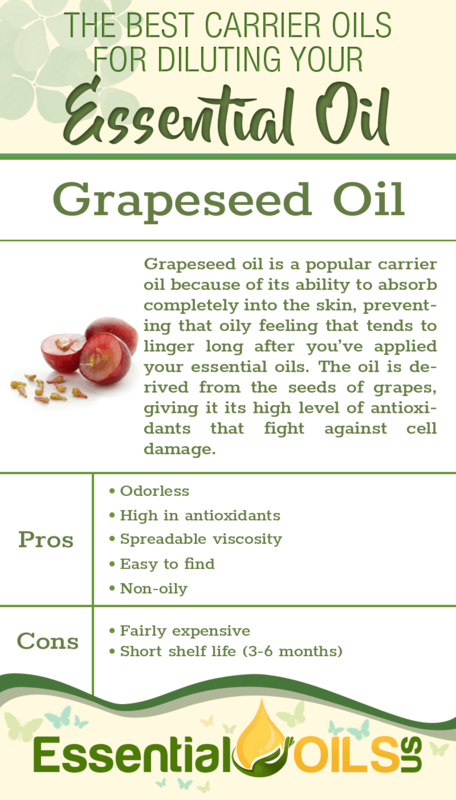 Grapeseed oil is relatively odorless, making it the perfect choice for those who have a sensitive sense of smell. Plus, the light viscosity means that it spreads across the skin with ease. 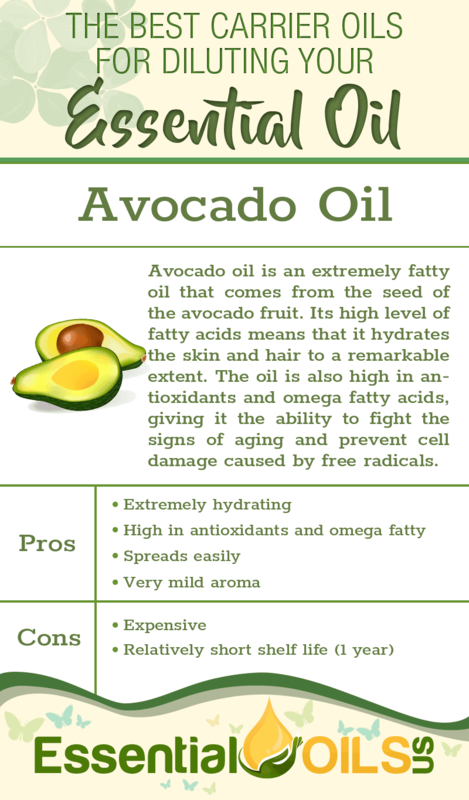 Avocado oil is an extremely fatty oil that comes from the seed of the avocado fruit. Its high level of fatty acids means that it hydrates the skin and hair to a remarkable extent. The oil is also high in antioxidants and omega fatty acids, giving it the ability to fight the signs of aging and prevent cell damage caused by free radicals. Avocado oil absorbs into the skin slowly, making it an excellent choice if you’re interested in creating a massage oil. It spreads very nicely on the skin as well. 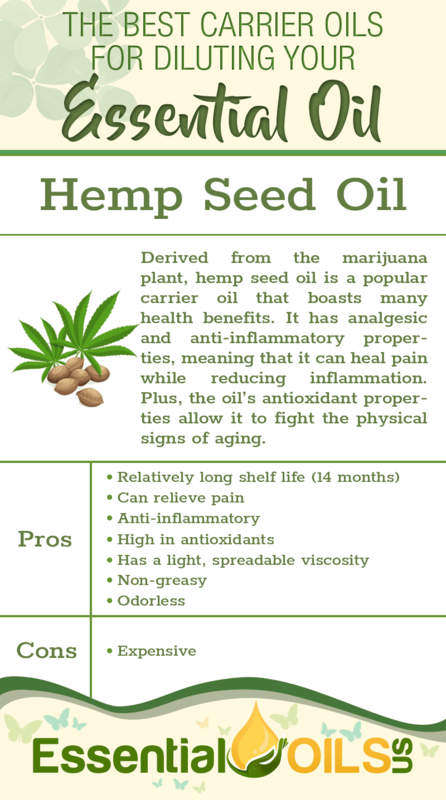 Derived from the marijuana plant, hemp seed oil is a popular carrier oil that boasts many health benefits. It has analgesic and anti-inflammatory properties, meaning that it can heal pain while reducing inflammation. Plus, the oil’s antioxidant properties allow it to fight the physical signs of aging. Hemp seed oil doesn’t leave the skin feeling greasy. Therefore, it’s an excellent choice for those who want to make a massage oil or a moisturizing oil for the skin. And, it’s virtually odorless. 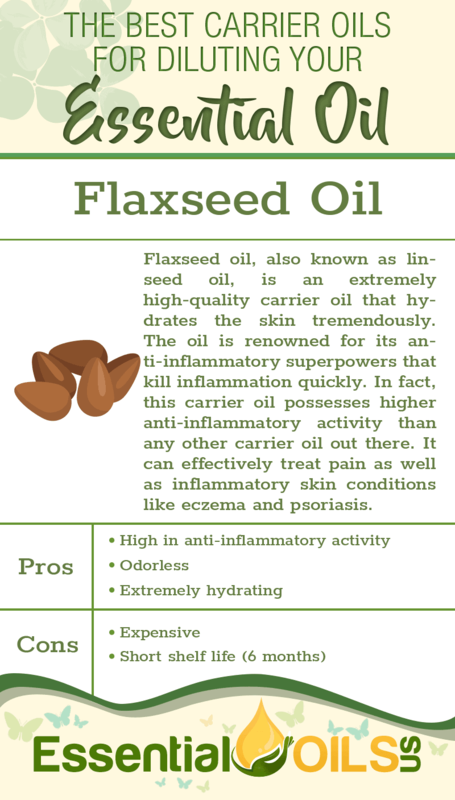 Flaxseed oil, also known as linseed oil, is an extremely high-quality carrier oil that hydrates the skin tremendously. The oil is renowned for its anti-inflammatory superpowers that kill inflammation quickly. In fact, this carrier oil possesses higher anti-inflammatory activity than any other carrier oil out there. It can effectively treat pain as well as inflammatory skin conditions like eczema and psoriasis. 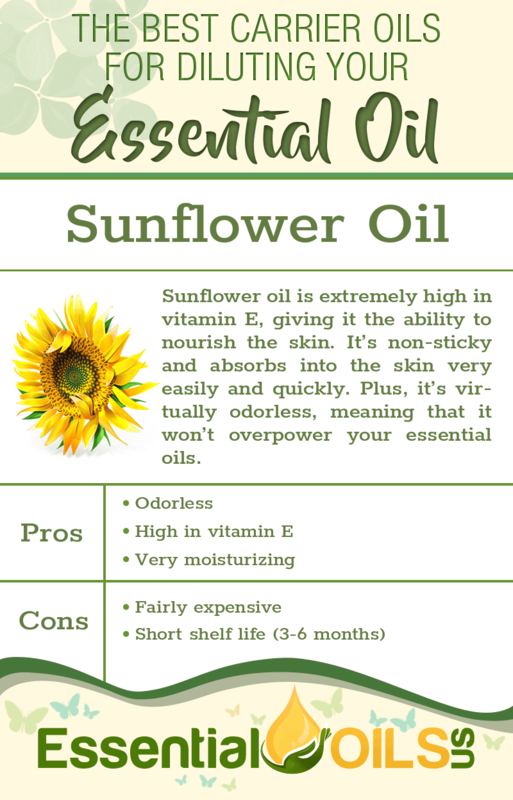 Sunflower oil is extremely high in vitamin E, giving it the ability to nourish the skin. It’s non-sticky and absorbs into the skin very easily and quickly. Plus, it’s virtually odorless, meaning that it won’t overpower your essential oils. 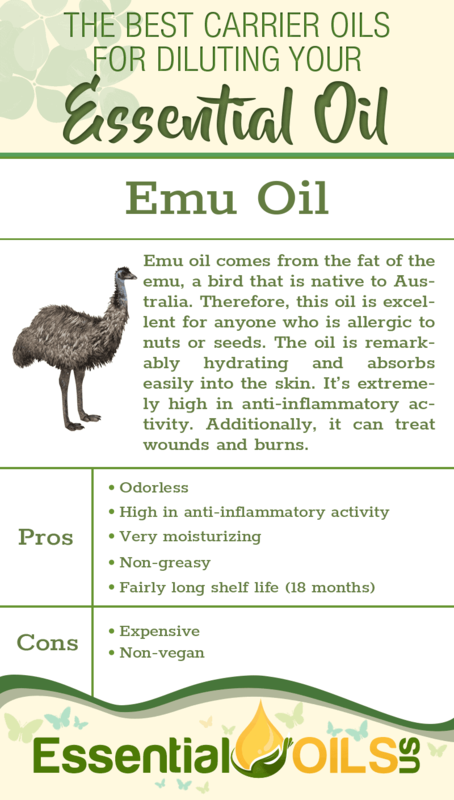 Emu oil comes from the fat of the emu, a bird that is native to Australia. Therefore, this oil is excellent for anyone who is allergic to nuts or seeds. 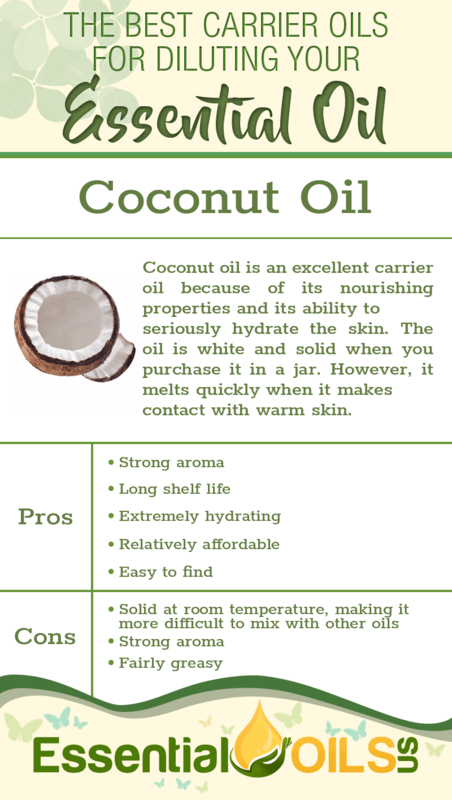 The oil is remarkably hydrating and absorbs easily into the skin. It’s extremely high in anti-inflammatory activity. Additionally, it can treat wounds and burns. Emu oil won’t congest the pores, meaning that you can use it liberally as a facial moisturizer. Plus, it’s odorless, meaning that it won’t negatively interact with the aromas of your essential oils. 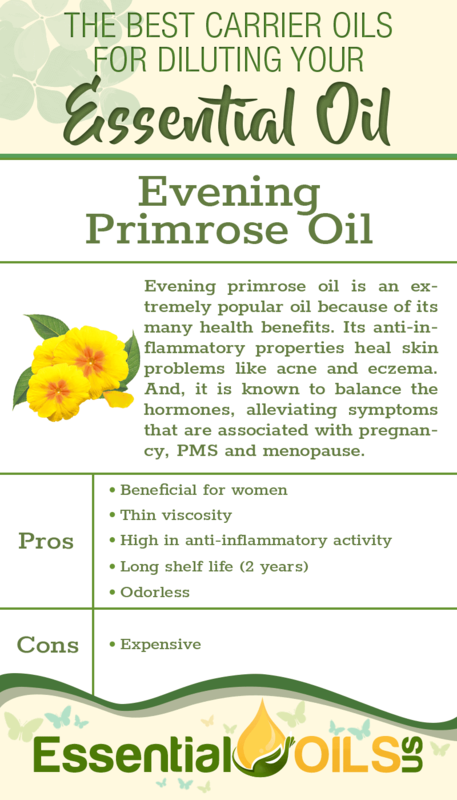 Evening primrose oil is an extremely popular oil because of its many health benefits. Its anti-inflammatory properties heal skin problems like acne and eczema. And, it is known to balance the hormones, alleviating symptoms that are associated with pregnancy, PMS and menopause. Its thin viscosity allows it to spread easily along the surface of the skin. And, its aroma is incredibly faint, meaning that it won’t overpower your essential oils. As you can see, there are so many beneficial carrier oils that you can buy. They all vary in price, viscosity and shelf life. However, any of these oils will most definitely help you apply essential oils to your skin in a safe and non-irritating way. I was trying to find you on Facebook, but I am having no luck. I would like to follow you to learn more about essential oils.